This Matrimonial Website project is a web based application developed in asp.net with c# language using SQL server database. The Matrimonial Website or marriage website is online platform that works as marriage broker. The matrimonial website is an online platform that help people to find life partner by their choice. This website provide feature for both grooms and brides to find their matching life partner. There are main tree module in this project Member, Visitor and Admin we will discuss all later in post. Abstract : The matrimonial website is an online platform that help people to find life partner by their choice. 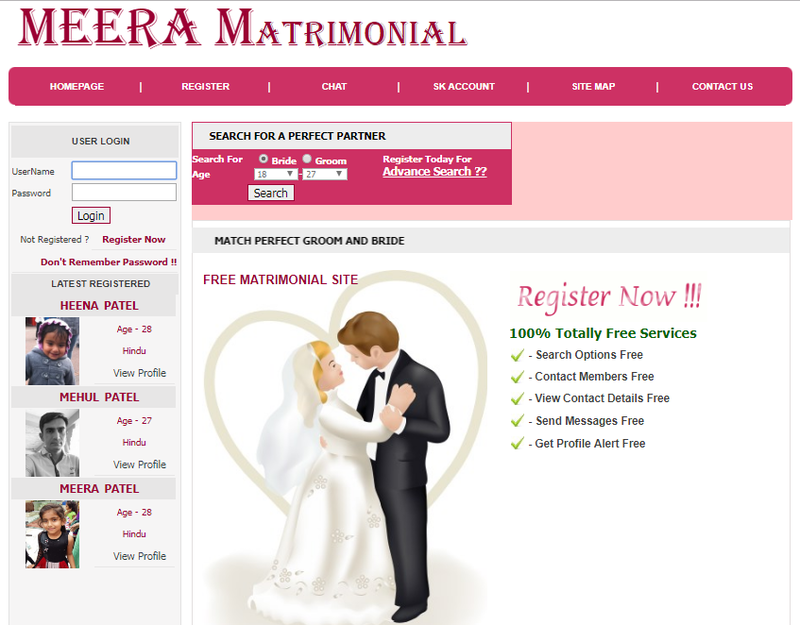 In this fast era all are familiar with matrimonial website concept. It is very hard to physically find life partner as per our choice or like even it is impossible now. For getting best life partner as per our need we have to contact marriage broker to find life partner. A matrimonial site helps to both groom and bride to find their life partner as per their criteria and choice without contact broker. At time of registration we need to fill up our all detail along with life partner detail, so the matrimonial site can automatically filers and matches find as per your life partner detail and give you best matches result. You can also use search facility which helps groom and bride to get best partner to make matrimonial easier. After becoming a member of this site you can get alert for best match for your profile and also can send/receive messages, get contact detail and make online chat with other members. We also provide advance search facility for our members. There are three modules we developed in this system Member, Visitor and Admin. Admin is a owner of website who are responsible to run whole website. Admin is a person who can activate and deactivate members account. Admin can watch all activities done by members and take action against mischief activities of members. Members are register users of our website. For becoming a member of site user need to fill up registration forms with all detail. Member has to also fill up partner detail so we can give best result as their partner detail. Members have to fill up life partner detail at the registration time so based on detail we can give best match partner. After login to site members can get advanced search facility to easily find life partner. They also check profile of other member and send messages and using online chat facility. Visitor is also a member of our website, but there are some restriction on his activities. Visitor Profile can not display in search result and visitor can not check full profile of other members. At the registration time visitors have not to fill up full address detail, they have to only fill up personal detail and partner detail. Visitor can not use message services and online chat services.